2018 began with the DCP (Dismantle Corporate Power) campaign taking part in the Alternative Mining Indaba (AMI) in February aiming to present an alternative voice and community voices to that of corporates that met at at the annual Mining Indaba. The DCP-campaign introduced community members and stakeholders to the idea of the Right to Say No in a session around Free, Prior and Informed Consent (FPIC). FPIC is a principle protected by international human rights standards, which guarantees the right by affected communities to be informed about planned mining activities prior to any realization thereof, after which they can take a decision that is free from any obligation, duty, force or coercion whether or not they want the development to take place. 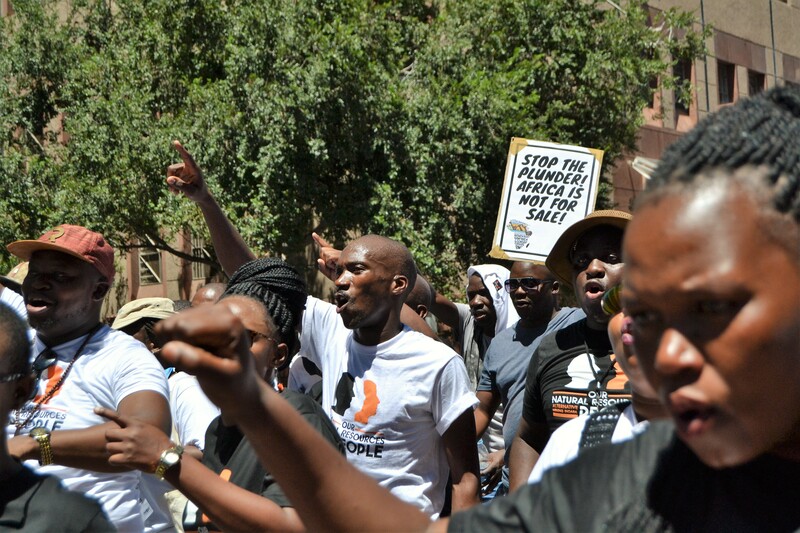 The DCP-Campaign took part in several activities during the days of AMI such as the Public Forum “Solidarity against Mining in Africa ” held at the AIDC and the protest march to the Cape Town International Convention Centre where the official Mining Indaba took place. The protest ended with the handing over of a list of demands to a representative of the Mining Indaba. One of the key focuses for the DCP campaign is the campaign for the “Right2SayNo!” , that involves the demand for communities to actively be involved in the decision- making process of development and give consent. Therefore the campaign forms an essential element in amplifying community voices, grassroot processes and law from below. Whilst mining affected communities are one of the key actors that the campaign is aiming to stand up with, it also seeks to collaborate with communities affected by any large-scale development that is not in their interest. Mining affected communities in South Africa have compiled a petition, hosted on Change.org, where they are demanding the Department of Mineral Resources to stand with communities in supporting the Right to Say No! The petition has garnered 2,124 signatures since its launching 3 weeks ago. The goal is to get to 1 million signatures before the April Court Case so if you are reading this and haven’t signed yet, please do so soon! The court case in question will take place on April 23rd to 25th in Pretoria, when the Amadiba Crisis Committee (ACC) is demanding their Right to Say No to extractivism and waiting for the final declaratory order against mining in Xolobeni. We ask members of the civil society to come to Pretoria and support the court case on the ground, as it is not only important for the Xolobeni community itself but for all communities trying to oppose extractivism on their land. A positive outcome could be a milestone for the implementation of the Right to Say No and a an iconic example for other communities to draw on. The concept of the Right to Say No! has drawn a lot of attention in recent weeks with increased social media attention such as in the the Amandla!Ulutsha Newsletter’s 5th issue, which set its main focus on the Right to Say No and alternatives to mining and extractivism. The article in the Amandla!Ulutsha Newsletter on the Right to Say No was used in two further newsletters: Intercoll and International Viewpoint. In November, the DCP campaign will host the 3rd Session of the Permanent People’s Tribunal (PPT) with three potential cases. The PPT is a public opinion tribunal that is independent from state authorities and bases its work on international human rights law using the principles of the Universal Declaration of the Rights of Peoples proclaimed in Algiers in 1976. The 3rd session will serve as a platform for communities to come together and not only share their grievances against transnational corporations in front of a global audience, but also map out how the fight against the looting resources and environmental degradation should be intensified and further strengthen their demand for the Right to Say No!